Da es in WoW eine Reihe von Features gibt, die nur von wenigen Spielern wirklich dauerhaft verwendet werden, haben die Entwickler von Blizzard sich bereits vor einigen Wochen dazu entschlossen, diese von vielen Personen bisher gemiedenen Spielinhalte in einer neuen Reihe von Artikeln etwas genauer vorzustellen und zu erklären. 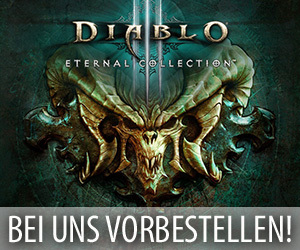 Der nun vorgestern veröffentlichte neue Teil dieser Reihe beschäftigt sich dabei mit den Reittieren aus Warlords of Draenor und den Orten, an denen Spieler diese Mounts finden oder laufen können. In this series of blog posts, we’ll look at some of the content in World of Warcraft where you might need a helpful nudge in the right direction—maybe you’re stuck, maybe you got sidetracked, or maybe you don’t even know how to begin! Join us as we travel all over Azeroth and Draenor to uncover and thoroughly tackle the many different little adventures available to any player. In this edition, we’re looking at some of the more fun and interesting ways to grow your collection of mounts. If you haven’t done much (or any) mount collecting since the launch of Warlords of Draenor, you’re in for a treat, as the latest expansion introduced more than 40 new mounts to the game. Some are exceptionally difficult to obtain, but this article focuses primarily on mounts that more easily attainable—but still require a bit of effort and know-how. What follows is intended for players who haven’t already overcome the content, though keep it mind it will contain minor spoilers. If this particular information isn’t for you because you’re already a mounted master, then well done! In the comments below, let us know what you’d like to learn how to master in a future blog post. Your Garrison offers you the most direct way to get your reins on 10 new mounts, eight of which are available via the Stables. If you don’t have a Stables, it’s a building that requires a large-sized plot, so you’ll have to demolish your Barracks, Bunker/War Mill, Gearworks/Workshop, or Mage Tower/Spirit Lodge to make room for it. Don’t worry if you want to demolish the Stables later once you’re done with it—any mounts you earn from the Stables will remain in your collection permanently. The quests will require you to track down wild beasts in various zones, lasso them, break them, and ultimately tame them and make them love you. Once you have all six, you can take on the achievements Advanced Husbandry and The Stable Master. The first rewards an Armored Frostboar, and the second grants you the Armored Frostwolf. This is where things get tricky. The achievements require you to go to Nagrand and kill each of six named enemies while mounted on each of your six trained mounts. Additionally, you have to have a debuff item in your possession. For Advanced Husbandry, you’ll need to have the Black Claw of Sethe, and for The Stable Master, you’ll need to complete all 36 kills while under the effects of the Garn-Tooth Necklace. Look around your Stables for those items, and be ready to move slower and take more damage on your trained mounts when you’ve got them. For an in-depth walkthrough of the Stables, check out the Guide to the Garrison Stables on Wowhead. In either case, you’ve got to build a Trading Post, advance it to at least level 2, and gain a lot of rep. Once again, Wowhead has the lowdown with their Laughing Skull Reputation Guide and this Sha’tari Defense Reputation Guide. The most basic way to acquire any of these mounts is to hunt down the rare creatures that drop them, usually by spending some time in each of the spots where they are known to spawn. 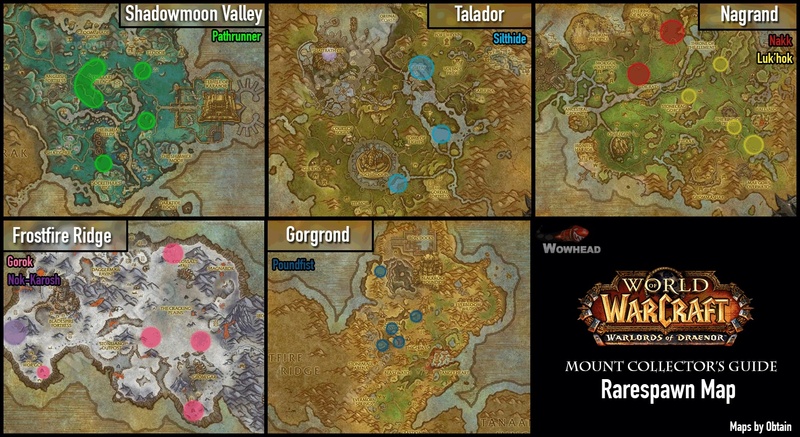 Over on Wowhead, a community member named Obtain has published a handy map of their spawn points, and if you’re looking for more detail, check out his Warlords of Draenor Mount Collectors Guide. The key to wrangling these rare mounts is patience. The enemies that drop them spawn very infrequently, and in only one of several possible places, so a fair amount of luck is required. Wherever you place yourself, you’ll likely be far away from most of the other spawn points, and these rare creatures are usually taken out quickly. However, once you’ve collected most of them, it will get easier to find the others, since you’ll have so much less territory to cover to do so. You may have overlooked or never known that there are seven mounts available to you to purchase in Warspear for gold and Apexis Crystals (and more are coming in Patch 6.2!). If you’re interested in gathering Apexis Crystals to pick up these mounts, refer to Wowhead’s Farming and Spending Apexis Crystals in Warlords of Draenor guide. You can only find these four mounts in the Invader’s Forgotten Treasure left behind after you earn a Gold Rating in your defense. The chance of finding each in your cache is quite small, so you’ll want to keep defending your and your friends’ Garrisons each week. For some good advice on getting a gold rating, check out the Garrison Invasions guide on Wowhead. Are you hitting any snags expanding your mount collection in Draenor? Tell us about it in this forum thread in our General discussion forum. Master mount collectors are standing by!